Last time we talked about some of the challenges that we can face running a craft booth at an outdoor event. One of the very important issues outside, is how to build display boards that will not blow over in a gusty breeze. Clumsy or careless customers knocking over displays can be an issue at indoor events, too. One of the things that I learned quickly was that if one display board falls over most customers will run for the hills, whether it was their fault or not. 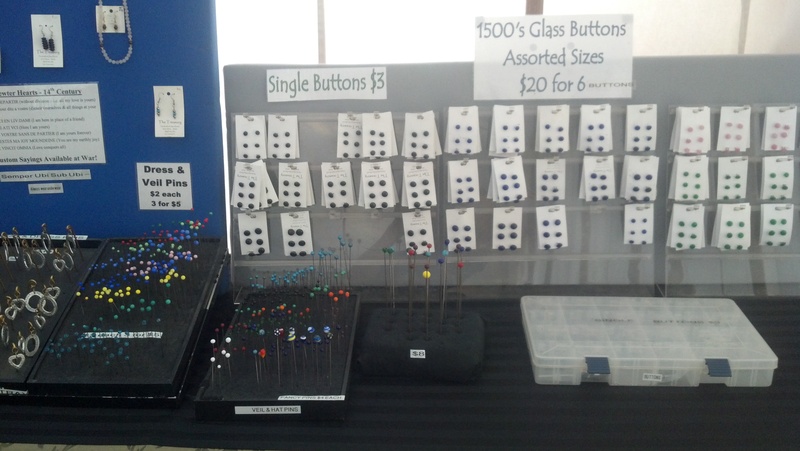 When I started selling jewelry at outdoor craft fairs, I used the small necklace display boards that are often used in mall jewelry shops. But it didn’t take long for me to realize that I needed to make better use of vertical space. “Going up” lets you show more items in the space. From that first outdoor event I learned that my display boards needed to be very sturdy to withstand whatever the weather could throw at me. Before you build your display boards you need to consider what size they should be, how you will hang your items on the boards, and whether you want to always hang the same things on the same boards. Alternately, you could have more flexibility in terms of board layout. Once you think you understand these facts, then you need to choose the display board materials and what it will be covered with. Whenever I think of display design, I remember a very wise teacher that I had once in a class on booth design. He basically said “Ladies, don’t ask a male friend to build your displays. We will build it. We will use two by fours and 1″ plywood, it will weigh a ton, and require a large team of sturdy men to set it up.” He then recounted a story where he and some friends used recycled solid antique doors to create a display space for a friend’s paintings. It looked awesome and worked very well. BUT, with each door weighing 80 to 100 pounds and eight doors in the display, it took a small army of sturdy men to set it up and a truck to haul all of pieces. Consider whether you’ll set up the display by yourself, how far you may need to transport it, and what sort of vehicle you will need to hold all of the pieces and any tools needed to set it up. Most convention center environments have strict regulations about what you are allowed to bring in yourself and what you have to pay someone to haul for you. These contractors are often hired by the convention center and can be quite expensive. Make sure that you investigate what the rules are about you bringing in displays. How far away will you have to park? Will you be allowed to use a dolly or wagon to bring in your displays and products? Most, but not all, outside venues allow you to drive to your booth to do set-up. When you are considering applying for a show, READ the rules first. Most will tell you when you are allowed to set up, and how you can do it. If you have questions, contact someone at the show to make sure that you understand the rules. Violating the terms for set up, especially at large convention centers (even if it’s a small show) can delay your setup significantly. Next time: More on building display boards and other display issues. This entry was posted in Jewelry, Vending at Events and tagged Craft, Craft Booth Design, craft shows, Display Board Design, Etsy, Facebook, Fine art, Jewellery by Eirny. Bookmark the permalink.